I usually post recipes and food ideas, but now and again I like to invite you along on my family holidays. 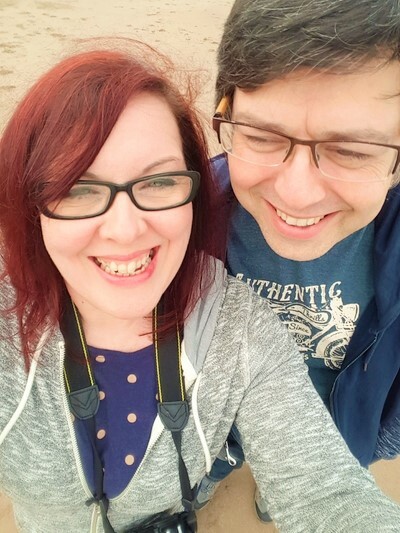 As well as getting to know us all a bit better, I always hope these travel posts will be helpful to other families planning a holiday. During half term (which was just a long weekend here in Scotland), we headed down to Chirnside, a hillside village near Duns in the Scottish Borders, quite near to Berwick-upon-Tweed. We booked a cottage from cottages.com. When I say cottage, it was actually a 4 storey converted mill and rather gorgeous. I want to move in and I mean for good! On the ground floor is the entrance and a huge garage space. Up a wooden staircase and you're on the landing leading into a living room with dining area, a huge kitchen, utility room and toilet. Next floor up there are two en-suite bedrooms and a single bedroom. We took the front room overlooking the stream and Cooper took the twin en-suite bedroom at the back. On the top floor there are another two en-suite bedrooms. My friend Andrew who came with us took the front room and my brother-in-law Lachlan took the back bedroom. The whole place, was fresh, modern and completely immaculate. We had everything we could possible need, although it's important to make yourself acquainted with the heating dials in the laundry room if you want anything more than luke warm water in your shower as we soon found out. I really enjoyed having a big kitchen, my own at home is teeny. We ate most of our meals in the cottage. Just simple food. We enjoyed a leisurely breakfast before heading out and wraps for lunch. 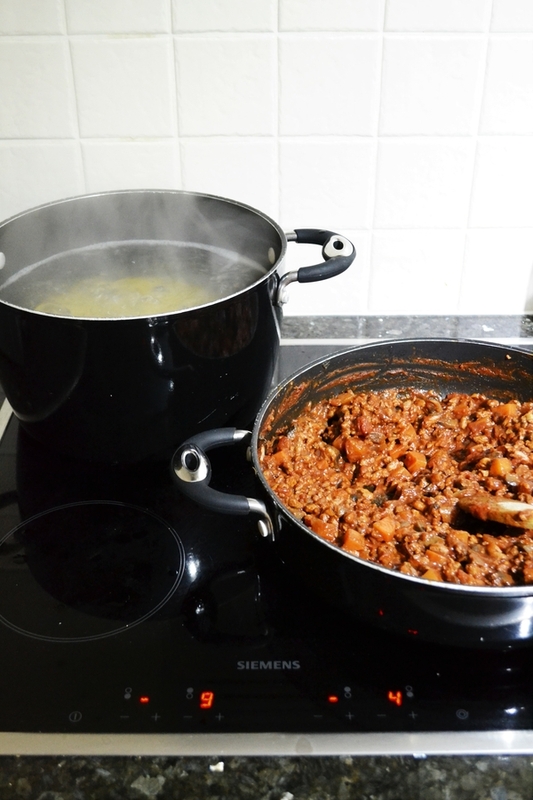 We had spaghetti bolognaise two nights running (it always tastes better day two) and baked potatoes with salad another night. Of course I took my Froothie blender with me. Graham couldn't believe it when I unpacked it. 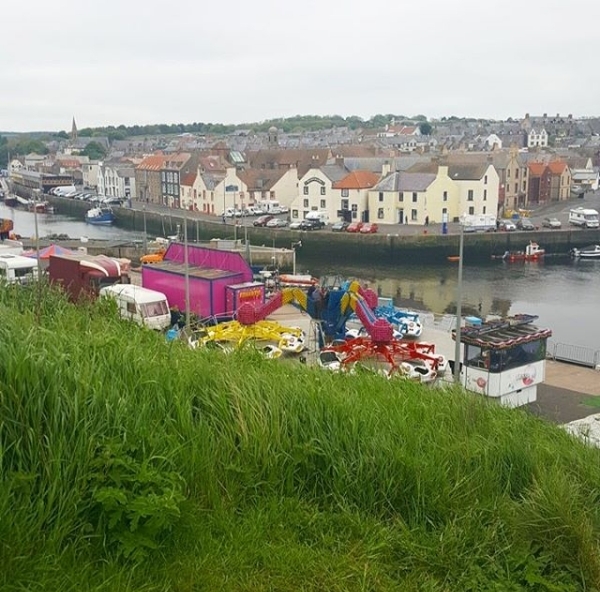 As well as lots of dog walks and running about in the grounds of the cottage, we visited the nearby fishing village Eyemouth, where there's a maritime museum, the most brilliant ice cream shop and a few pubs and gift shops. It's a nice wee village to stop at for lunch, but there's not really enough to warrant a full day there. We did a lot of walking with the dogs on Spittal beach just outside of Berwick-upon-Tweed. If we lived nearer it would definitely become a regular walk. There's a great kids park on the promenade as well as the prerequisite ice cream van, which seemed to stay quite late, which is a bonus. 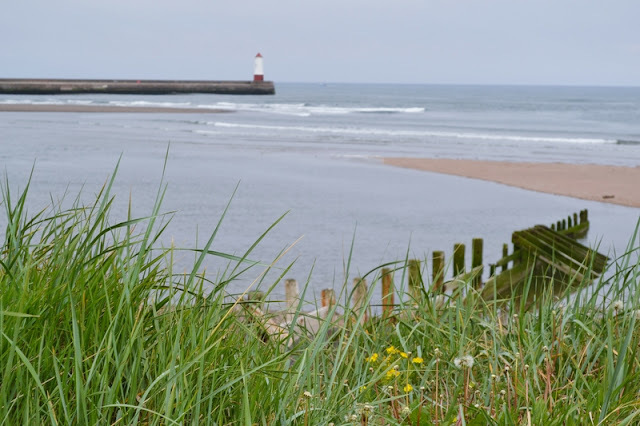 Berwick-upon-Tweed was also close by and it's a lovely town to have a wander round, do a spot of shopping or have a walk along the river before choosing one of the many pubs, cafes and restaurants for lunch. We picked a Lebanese restaurant called the Lazeez Grill House. It's doesn't look like much on the outside, in fact it looks like a cheap takeaway you would visit after a night out. 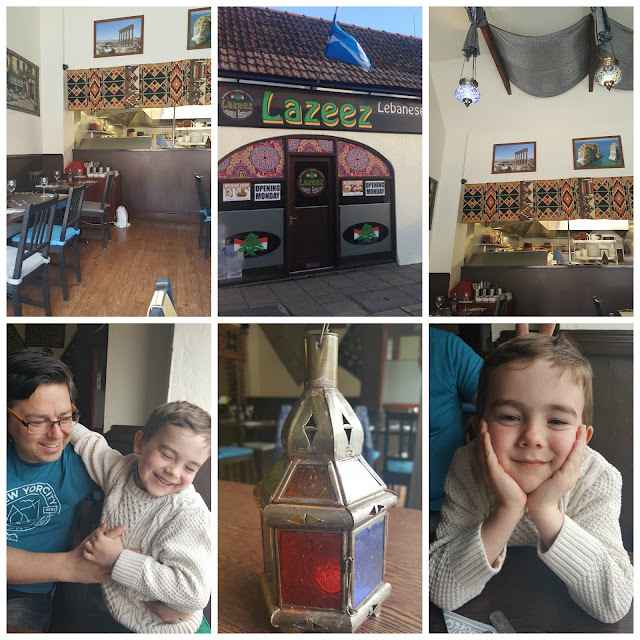 Venture inside the Lazeez Grill House and you'll find a very traditional Lebanese restaurant with friendly staff. We ordered a selection of starters for the four of us to share and soon realised we'd made a good choice. The food was excellent and there were plenty of vegan options for Graham. I could happily eat like this every day. It didn't break the bank either. 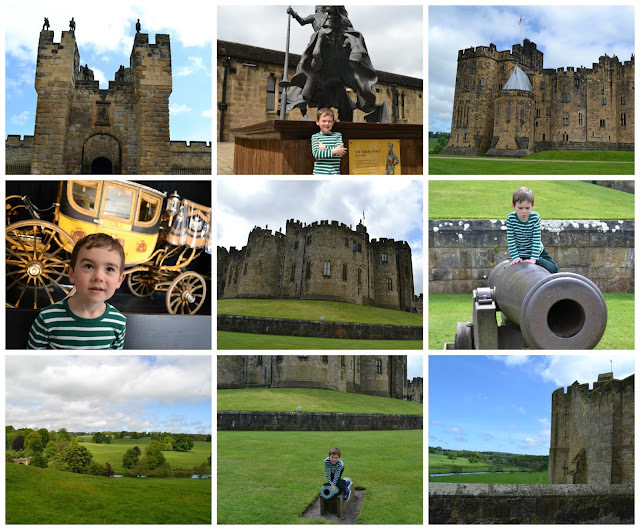 We spent a day at Alnwick Castle, which has been home to the Percy family for the last 700 years. It may look a bit familiar, if you're a Downton Abbey fan. Do you recognise it? It featured in two Christmas specials as Brancaster Castle. I can see why it was used in filming, it's rather splendid. There's plenty to see and do in the castle and grounds. 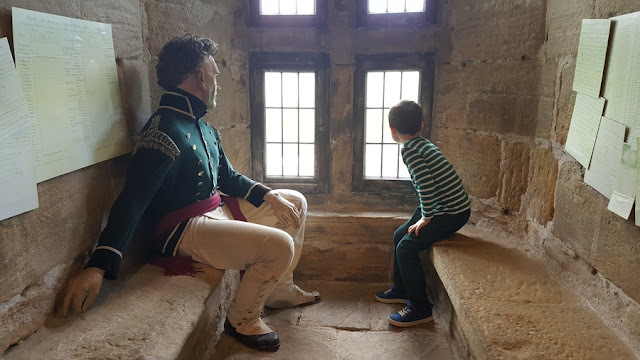 For children there's dressing up, broomstick training and a dragon's quest as well as lots of museum style rooms and state rooms, or you can just wander round the castle walls and take in beautiful countryside surrounding the castle. Lunch can be purchased in the outdoor courtyard dining area (some families took a picnic) or in the indoor cafe and of course before you leave you must visit the gift shop. After much humming and hawing Cooper picked a notepad and pen for his poetry, but later sneaked back in with Graham to buy a bow and arrow. Sheesh! 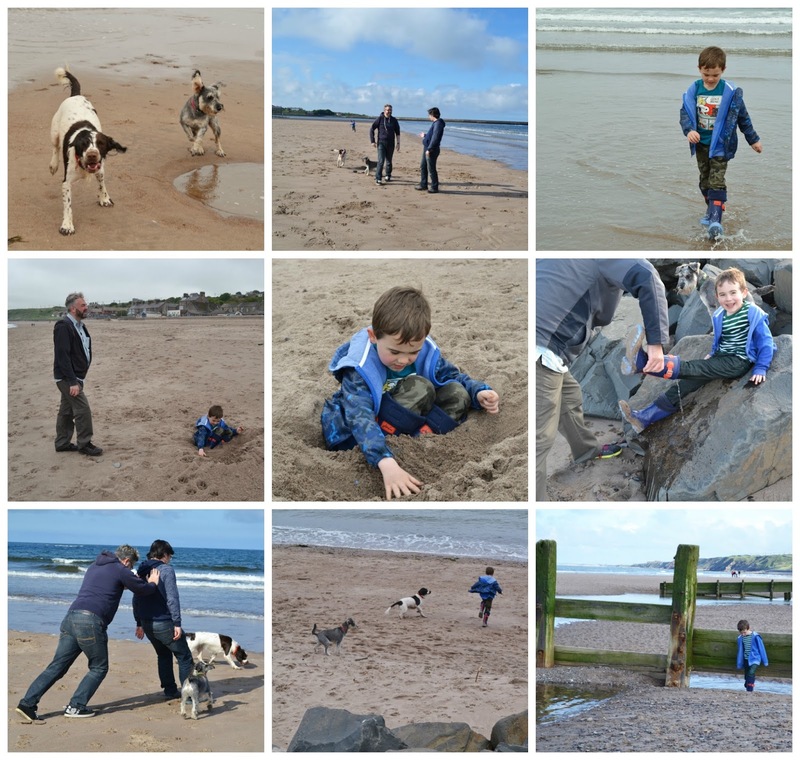 Cooper had great fun and we were really lucky with the weather. 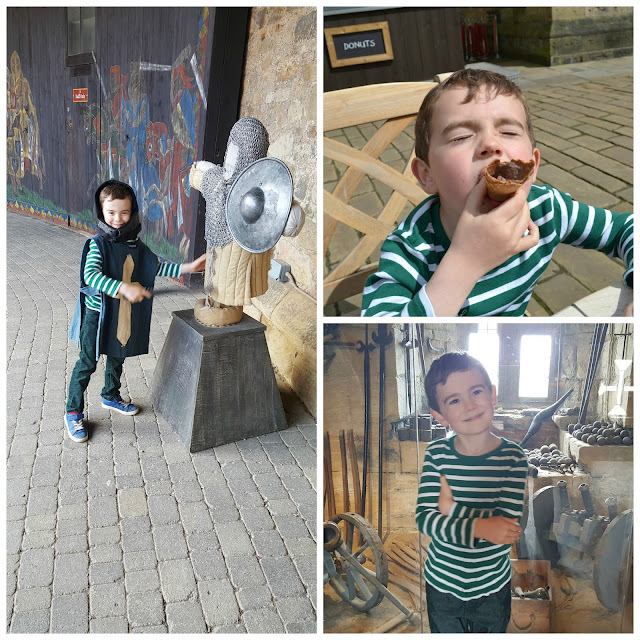 We spent hours at the castle but didn't manage to visit the state rooms and Cooper didn't want to do the dragon's quest or broomstick training, but he still had a great day. We were lucky enough to be at the castle while the medieval fayre was there. In the central green medieval tents were manned by tradesmen and women dressed in period clothing working on traditional crafts. We found out lots about bows, arrows, clothing, basket weaving, archery and all about the silk mistress. Cooper was less than interested in her skills and her dowry needless to say. The jesters were a big hit with him though and he was sure he could master the diabolo after watching them. In fact he was super confident he could put on a performance with a diabolo at his school talent show later that week. I had to put a halt to that idea, while having visions of him knocking someone out with it. We had a great holiday in the Scottish Borders and loved the cottage. We'll definitely be using cottages.com again and exploring somewhere new. If you're interested, our cottage was called Riverside Mews and was near Chrinside in the Scottish Borders. You can check out the official page for our cottage here and follow cottages.com on Facebook and Twitter for holiday inspiration. I hope you enjoyed a glimpse into our holiday and leave with a few ideas. Disclosure: cottages.com invited us to try one of their properties. They did not expect a positive review and any opinions expressed are my own. 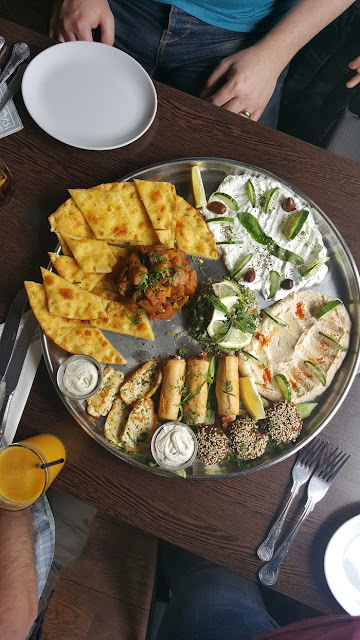 Lebanese cuisine is so delicious! Thanks Manu and I agree about Lebanese food, it's so good and there's always lots of choice for vegetarians and vegans. Ooh, looks lovely. The cottage you stayed in reminds me of our house in Hayford Mills - another refurbished mill that was laid out in the same fashion. We had sheep and Stirling Castle out the back. We did want to stay there forever, but alas! We never did get over to visit you there. Yes what could possibly go wrong? Maybe I should have let him go for it. He ended up reciting a poem he'd learned from his bedtime book Fora and Ulysses by Kate di Camillo. My daughter would love to go to Scotland. We're very into Katy Morag atm so anything Scottish is wonderful. Ah yes Katie Morag is fab. You'd have to go much further north than this though and out to the islands. Cottages.com may have properties there. They have so many. The islands are a really beautiful option for a relaxing holiday with lots of walking. 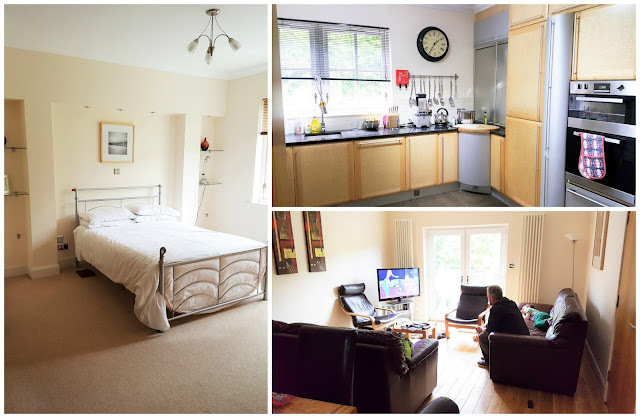 We love taking holidays like this - finding a really comfortable self-catering home and exploring the local area by car. This looks like such a beautiful region. Yes it's a good way of doing it and a bonus for us as parents. When we stay in a hotel we're in the same room as a sleeping child which doesn't make for much of an evening. We did eat well and the castle was fun. Wow that cottage looks amazing Jac! I'm jealous! Would love to visit sometime :) Love the presentation of the food at the Lebanese restaurant, Lazeez means delicious by the way :) Love the pics! Yes the cottage was gorgeous. Thanks for the translation, a good fit for the tasty food we had. Wow, that sounds like a fantastic break, a well deserved one though. And what bliss to be in a decent kitchen. I'm like you, mine is tiny. Can't believe you took your Froothie blender, that did make me chuckle. And the Lebanese food looks fantastic. Haha yes I sneaked it in when Graham wasn't looking. He did wonder why the bag was so heavy. Our car was a tight fit I can tell you. I know it's hard to fit it all in time and money wise. It was lovely seeing you when you were over. Yes we had such a good time. That Mill looks amazing!! What a fabulous place to base a holiday around. I know Berwick and Alnwick quite well from when I used to work in County Durham and explore the North East during my weekends off - such an amazing area. And that Lebanese restaurant sounds wonderful! It was a great place to stay and loads to do in this area as well. Hah, you taking the Froothie on holiday with you! Looks like a fab little getaway! I know. Well we were going by car and I knew I'd be cooking so I thought why not! Sounds like you all had a blast Jac. A place I've yet to visit! Yes it was great Stuart, such a fun holiday. I thought I was a bit bonkers taking my kit of matcha, turmeric drops and my frother for my immune drinks, but bringing your Froothie with you, that's another level! ;-) But it does make sense if you have a variety of folk to feed as it gets soups and smoothies done in a flash. It looks like you had a great time. I'm just sorting a trip to Cumbria with cottages.com. Maybe I'll even pack the Froothie! Haha I suppose it was a bit bonkers, but I didn't have to carry it on my knee or anything. It packed quite nicely into a jute bag.